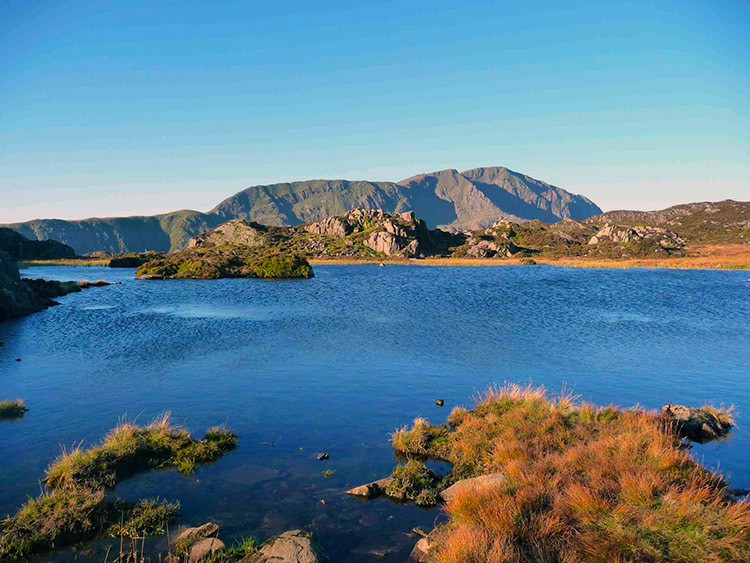 Summary: This very interesting walk in a beautiful part of the Lake District National Park is a well designed circular route which takes in six of Wainwright's Fells including Haystacks which was his favourite of all. On the walk are some stunning views of the high fells and mountains including Pillar and Great Gable which is climbed during the walk. The walk is kindly contributed by John Deasey and Neal Lever. The Walk: Neal had wanted to do a walk that went down to the Black Sail YHA hut after we had spotted it on a previous walk on Pillar. We saw an article in a magazine and we noticed a couple of routes on the Walking Englishman web site that we could join up to make a decent circular route taking in the peaks of Haystacks, Kirk Fell, Great Gable and Green Gable - all mountains we had not been on before plus we could visit the Ennerdale valley. Setting off from Honister Slate Mine at 8.00am, the day was set fair. The clarity in the air was stunning and this was the first walk for a while where there was a proper nip in the air - perfect. As we were already at more than 1000ft at the start of the walk, the first hour or two was an easy meander through slate mines, old quarry huts and clear tracks as we headed for Haystacks. All the time the path ahead was in view and was capped by a stunning background of Pillar highlighted in the morning sun. 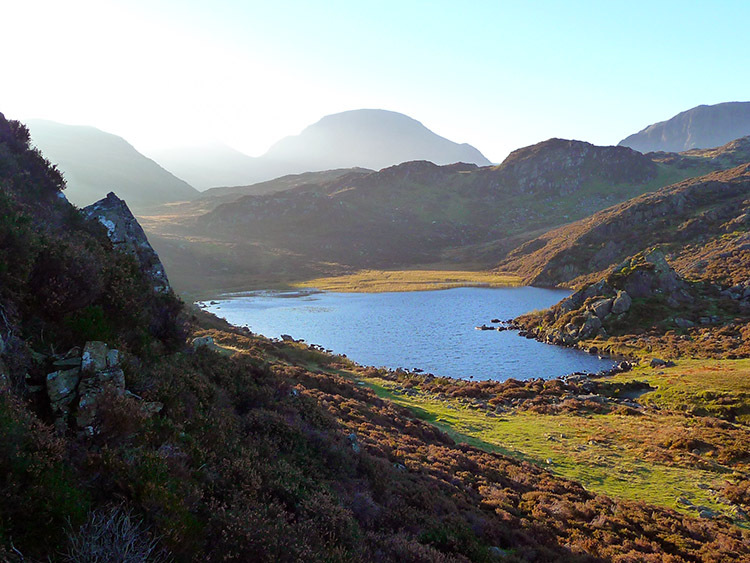 I must admit to being a bit bemused as to why Wainwright thought Haystacks was so interesting but as we found, it is full of surprises and delights. The path twists and turns amongst heather, rocks, tarns and deep gullies. Every now and then you get a stunning view down into Crummockdale - it is an absolute delight and you could quite easily spend another couple of hours investigating this lovely mountain. The atmosphere around Innominate Tarn was amazing - absolutely silent, with a view of Pillar to die for. 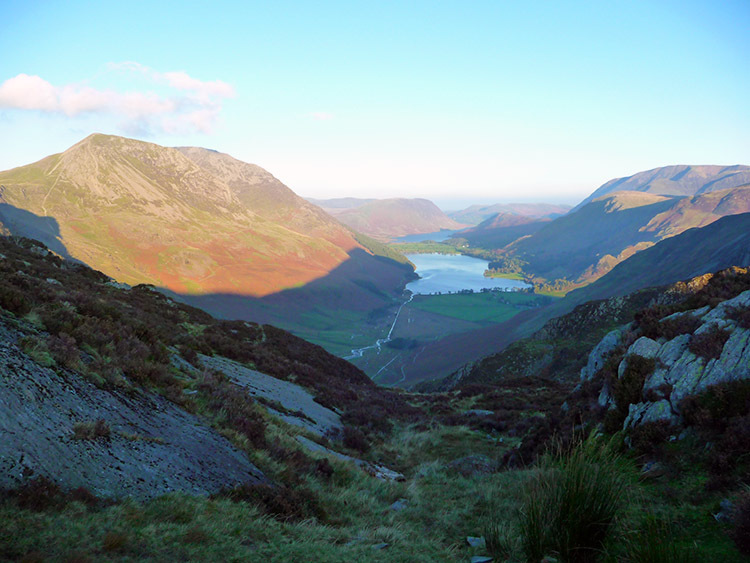 Rather than finding a clear path off Haystacks we sort of plummeted straight down into Ennerdale via a sheep path and then clambered over a fence to meet the path coming down from Scarth Gap Pass. 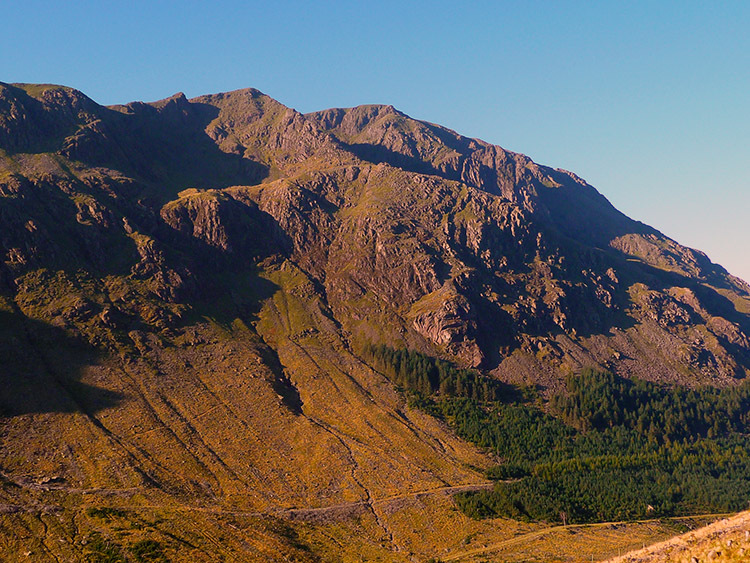 Ennerdale valley was totally deserted and deathly quiet and it was fascinating to see our main target - Great Gable - standing like a sentry at the head of the valley, with the sun rising around and above it. From the bottom of the valley floor it looked like we had to go an awfully long way up ! A short stroll soon brought us to the Black Sail Hostel where we reflected on possibly the easiest and most enjoyable start to a walk that we had undertaken. However, sitting there on the valley floor, looking up at Pillar, Kirk Fell and Great Gable reminded us there was some serious work to come. Soon enough, we hit the vertical button. Shortly after leaving the Black Sail Hut we crossed the bridge to aim for Black Sail Pass. Make no mistake, this is a steep, steep section. Very easy underfoot but very hard on the quads and lungs. Neal and I are pretty fit but we were soon in oxygen debt! What seemed like an eternity later, we hit the Pass and took a quick breather. Now we had to take a left turn and head straight up Kirk Fell and as we did we met the strangest guy who was walking with his wife and asked if we knew where "Gavel Neese" screes were - we did not and so suggested he looked at his map - "oh, I haven't got one, we're doing this free hand.....!". No rucksack, no map, no compass - nothing at all! He explained these screes were between Kirk Fell and Great Gable (which on checking a map afterwards, they are...) and we really felt like saying "You're a nutter - clear off!" Anyway, we told him where we were headed and he decided to follow but couldn't keep up thankfully and soon dropped well behind. It was a pity because we would have loved to see his face when we somehow managed to find Baysoar Slack! We have this habit of finding scrambles on most of the walks we undertake and this was no exception. 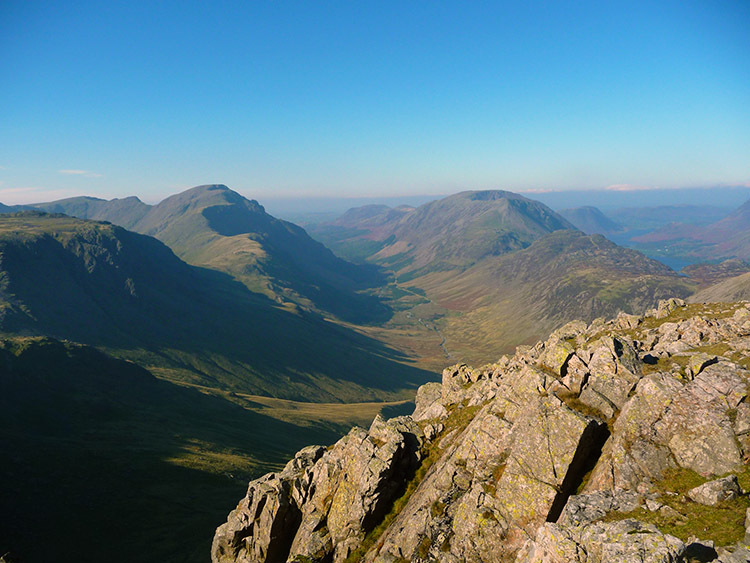 A path that was reminiscent of a climbers traverse led us into a deep gully, very similar to Lords Rake on Scafell with boulders, scree and rocks tinged with red. It was a tricky scramble, not exposed or dangerous but it must have concentrated our minds because we did not take any photos ..... a pity because at one stage Neal had a good 10 or 15 feet sliding back on scree. He disappeared from view for a minute! After the hidden scrambling delight an easy walk up the summit of Kirk Fell followed with stunning views down into Ennerdale and Wasdale. One view that will remain we us for a long time was that of Great Gable from Kirk Fell - a huge, towering, forbidding view that really gave no indication you could get up it - an amazing view. Now the wind was getting up and it was getting colder so we decided to crack on and head for Beck Head. 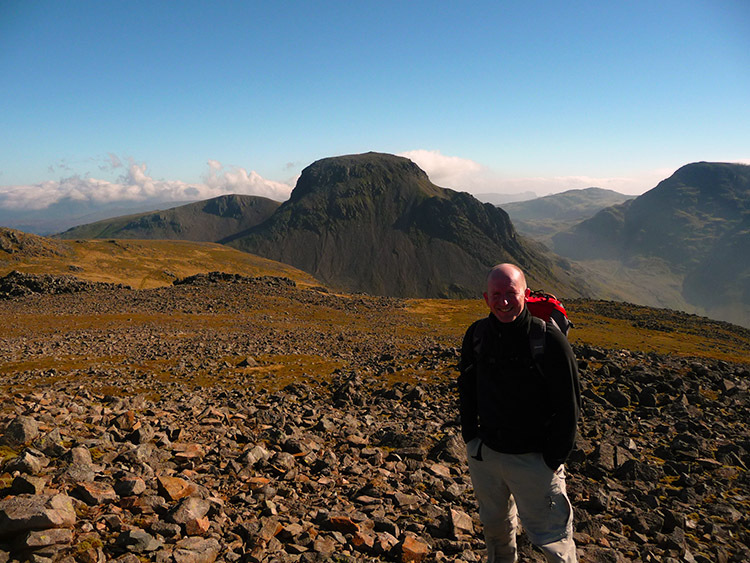 This was a decent scramble down and with the view of Great Gable ahead we tried to conserve as much energy as we would. The ascent up Kirk Fell from Ennerdale valley had been quite sapping. Away in the distance we then saw the "man without a map" heading off in a different direction, somehow ahead of us and hopefully about to launch himself and his wife down the scree slope he was aimlessly looking for! We never saw him on Kirk Fell so he must have gone round the side of it somehow using his own imaginary map. 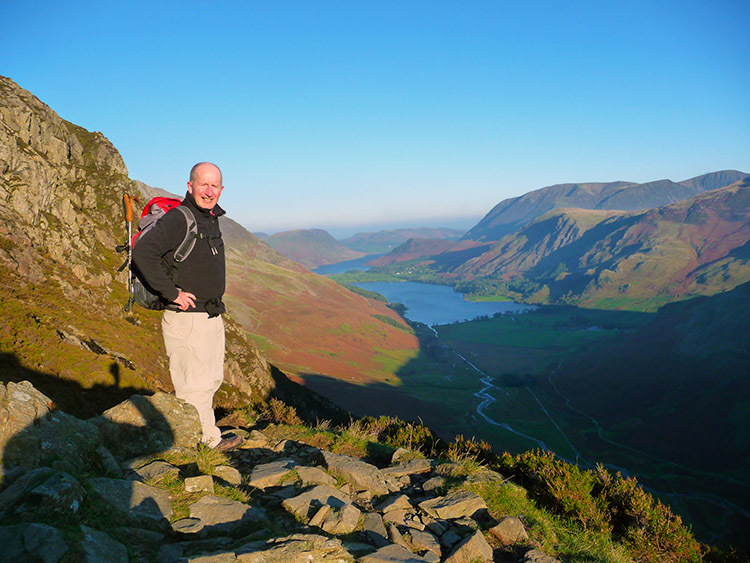 Anyway, back to the adventure and facing us was a 700ft climb up to Great Gable - it looked steep and it WAS steep. Every 100 ft or so there would be people sitting down catching their breath whilst others gingerly picked their way down - it is fair to say this about the busiest section of the walk but still, plenty of room for everyone? This was hard work and with the wind getting up, gusts were hitting us at different angles causing all sorts of problems. I had deliberately left half my pork pie in my rucksack as ballast and this was now proving very useful. Neal used to have a lot of ballast of his own but after several walks and some fancy protein diet he could have done with his own own pork pie now. For us, the hardest part of the walk was over and it had been a fantastic day up to now but the skies were a bit hazier now and the wind was almost getting uncomfortable. Fittingly, we had to cross Windy Gap and as as descended Great Gable towards Green Gable, we could see other folk suddenly having to almost get on hands and knees to cross the gap - it was comical, but as we were relatively sheltered at this point we had no idea how strong the wind would be. As we got down to the Gap it was the nearest thing to being in a wind tunnel I can imagine. I was almost blown off my feet completely (being a bit of a lightweight) and we had great fun seeing how far we could lean into the wind before falling. Neal managed the best angle as I was in danger of taking off and being swept down Stone Cover back into Ennerdale. A quick wind-blown ascent of Green Gable followed which was a breeze compared to the ascents so far and then the route home was laid out before us. 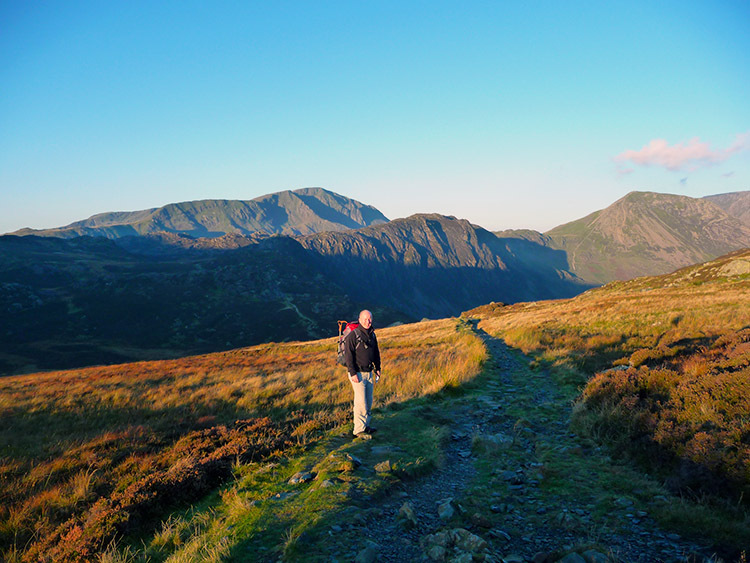 We could have bagged another couple of peaks in Brandreth and Grey Knotts but there was no need this time as we had a delightful route planned above Moses Trod back to the miners track and then down to Honister and the car park. A brilliant day out once again and a great way to link in three of the most stunning valleys in the Lakes.